In the 2006 schedule of events for the Welland County Motorcycle Club you will see among other things, their 19th Annual Poki-Barbi-Dan, (this is a combined Poker Run, barbecue and dance, and obviously a lot of fun), a National Championship Trial, a “Help A Child Smile” Breakfast & Charity Fund Raising Ride, a World Championship Hare & Hounds, and the Paul Travis memorial Mystery Tour. Add to this a full slate of the popular CMA sanctioned Speedway and Dirt track events with some of the top riders in the country, and you quickly come to the realization that this is a very active, enthusiastic and all encompassing motorcycle club, offering something for just about everyone! 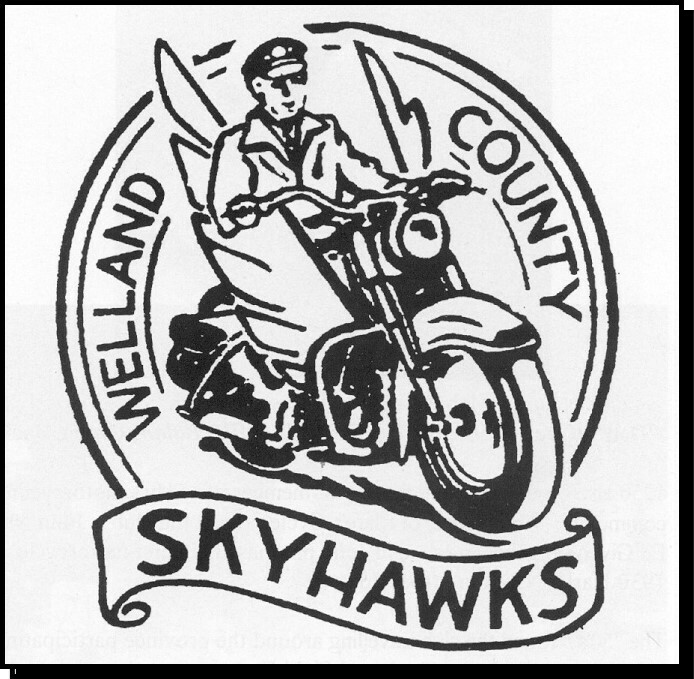 This ambitious Type of annual agenda speaks volumes for the Club, its executive and membership both past and present, and explains, at least in part, why the Welland County Motorcycle Club is, like the CMA celebrating its’ 60th Anniversary in 2006! Ranking among the elite group of older motorcycle clubs in Canada, the WCMCC is a success story in which all the players can take a great deal of pride! The WCMCC story began in 1946 just after WW11. It was at that time that returning vets like Vic Svob, recalled when he and other motorcyclists gathered in front of Russels, CCM store in Welland, before the War. It wasn’t long before the tradition was rekindled and a small group again was formed. This group, Vic Svob, Rodger Demers, Mike Stifel, George Harpwood Stan Major and Jim Papp was basically responsible for founding what is now the Welland County MCC. The original name selected at their first “business” meeting was the Skyhawks. Early club meetings were held at a variety of locations in the area, with one of the more popular ones being Taits farm. This was popular because of a ‘natural drag strip’ located just around the corner, and it was customary to hold informal drag races before each meeting! The club met at that location for a ten year span dating from around 1949 through to 1959. Consistent with their collective enthusiastic nature and entrepreneurial spirit, the members bought shares in the club to finance the first dirt track event held at the old Welland Fairgrounds in 1951. This was followed by a second event the following year. Few things come easy in life though, and the financial burden of running these events proved to be too great a challenge for the club at that stage of their development. It was to be many years before they undertook similar ventures. Nonetheless, the WCMCC continued to grow and prosper as the membership base itself grew. The clubs relative prosperity may indeed be attributed to one Chester Osten affectionately know club members as “Dad”. Chester or “Dad” apparently was the club treasurer for many years and handled the clubs financial affairs with a pretty tight rein. He was, and is today always “there”, and always ready to lend a hand. 1950 saw the Club and its members participating in Hill Climbs, Enduros and Trials organized by other clubs in Ontario and New York State. One historic milestone was Bob Taits winning the first Canadian National title for the club. He became the 500cc Road Race Champion riding a 500cc Triumph Tiger in 1954. 1957 saw the WCMCC running their own Hill Climbs, and Scrambles in Fonthill and they continued doing this well into the 1960s. Good leadership and as mentioned before (good financial management by Chester Osten), enabled the club to purchase their own parcel of land. A half acre bought from Chesters mom. Construction of a 600 square foot clubhouse soon followed. There was no luxury of heat and hydro at that point; so the first “Official Clubhouse Meeting” took place in May of 1959. As small as these incremental steps may appear to us now, they were fundamentally the norm for those times, and important building blocks for the future. One of the more popular events that the Welland County MCC put on over the years was the Massassauga Enduro. This event ran from the mid sixties through to the mid eighties. It was one of the most popular Enduro events around, very challenging and drawing competitors by the hundreds from both Canada and the USA. It was in the mid sixties that the Club became incorporated and from that point take on their most ambitious challenge. The building of a quarter mile dirt track that would also convert to a TT track. This track was finally completed in 1975. To celebrate its 25th Anniversary in 1995, this small club held what was termed as a Super Race and posted a $10,000.00 race purse. This again attracted competitors from far and wide in both Canada and the USA. In 2001, WCMCC began running ATV Mud Runs, the events proved so popular that entries for the 2005 event drew upwards of 500 entries! 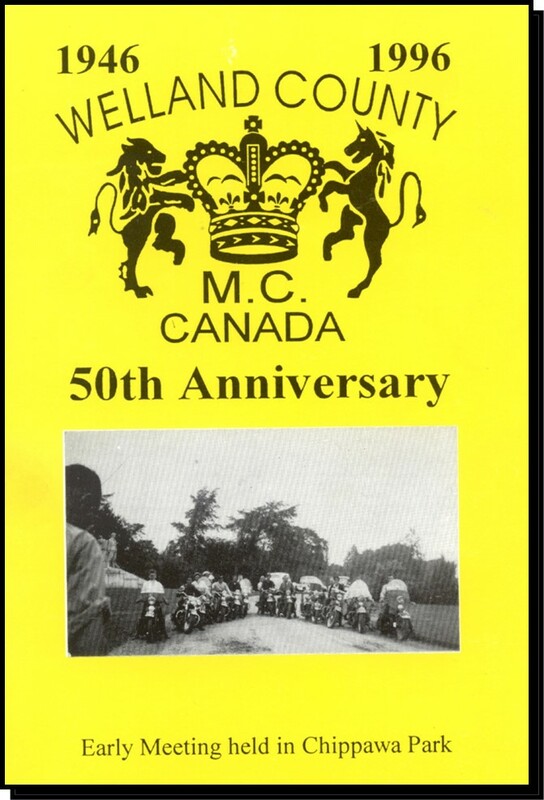 The Welland County MCC continues to run a wide variety of first class motorcycle events, both competitive and non competitive as outlined in their 2006 Schedule of Events referred to earlier in my opening remarks. The number of Canadian Champions from trials, Speedway, Dirt Track and Enduros coming from and through the WC MCC would read like a Blue Book or “Who’s Who” in Canadian Motorcycling.